The author enjoying the Calanques. Marseille, France. Europe is a popular travel destination for many reasons: its rich history attracts historians; its grand cities marvel visitors with eclectic architecture and centuries-old facades; the diversity among its different countries and cities make Europe favorable to nearly everyone; its skiing, hiking and running trails, and breathtakingly beautiful mountains and landscapes, attract adventurers and outdoors persons from around the globe. 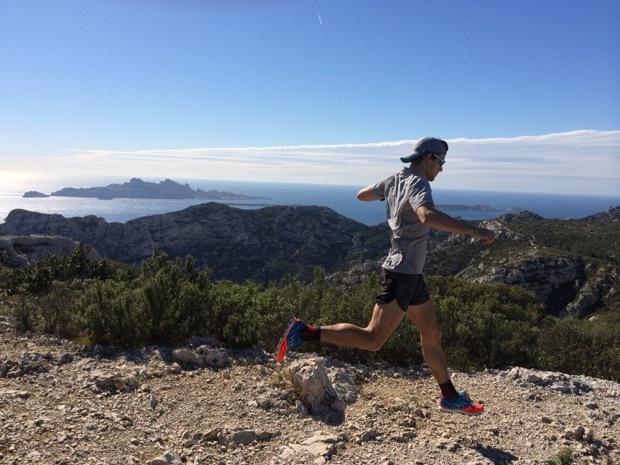 When it comes to running, Europe is renowned and revered for its extensive trail systems, which boast more technical and challenging terrain than practically anywhere else. Quaint mountain towns such as Chamonix and Annecy in France, Montreux and Zermatt in Switzerland, Innsbruck in Austria, and Brunico in Italy are well known and oft frequented by avid trail runners and outdoors people. The larger cities of Europe, however, don’t fit into the small nooks and crevasses of the Alps or Dolomites and so don’t afford the same first-rate trail running that can be found elsewhere. Nevertheless, these larger cities are the places that are typically visited most frequently. Where can the traveling runner explore trails and views in oppressive, building-laden and cement-filled European cities? Below are some of the best running options available in many of Europe’s larger cities. Situated in south-central Amsterdam, this park is accessible by foot from nearly anywhere within the city. The park has a 3.2-kilometer (2-mile) perimeter path of both pavement and dirt and has several more kilometers of dirt trails and paved paths cutting through the middle of the park. The park gets very crowded, especially on the weekends, so arrive early for a more peaceful experience. Tall mountains and big parks flank Barcelona—just like they do many European cities. The Parc Natural de la Serra de Collserola, or simply Collserola Park, is situated just north of the city center, is the closest of the surrounding parks, and is the largest metropolitan park in the world. The tallest peak, el Tibidabo—part of the Serra de Collserola mountain range, is around 515 meters (1,690 feet), which in close proximity to the city and sea affords incredible views. Take the S1 or S2 train toward Peu del Funicular and then the FV towards Vallvidrera Superior—or, depending on where you find yourself in Barcelona, run to the park—where you will arrive in the middle of the park with plenty of trails, paths, and roads to explore. If you stay in the city, run down the pedestrian highway in the center of Avenue Diagonal toward the ocean where you can pick up a wide, paved running and biking path along the beach. You can also run a track workout by the beach: pay 5.90 euro for a day pass to Mar Bella Sports Complex and you’ll have access to their first-rate track and dirt oval. It’s difficult to find elevation gain in this large, flat, European capital but dirt trails are easily accessible in the Große Tiergarten situated just west of central Berlin. Over a dozen miles of trails—paved and dirt—wind through the park, which contains many monuments and memorials to people and places from Germany’s past. Also try the paved path through the heart of Berlin along the Spree River for pristine views of the city’s many buildings and captivating architecture. Views along the Spree River in Berlin, Germany. Margaret Island might be home to the largest track in the world. The island is situated in the heart of the city and its 5.35-kilometer (3.25-mile) track—indeed, the surface is almost exclusively track, with just a short section of pavement—around the perimeter serves as an ideal place for a quick workout. To find trails, climb north on the roads out of the city toward the green space called Budai Tájvédelmi Körzetet and be greeted with rolling single-track and wide-open views of Budapest. Slightly west of downtown Ghent and easily accessible by foot, this nature reserve has a roughly 6-kilometer (3.7-mile) gravel double-track path around the perimeter and several more kilometers of dirt and gravel trails sprawling elsewhere. The park is mostly pancake-flat but a few rolling hills are accessible via trails near the eastern perimeter. Gravel paths and sunshine. Ghent, Belgium. Hyde Park and Regent’s Park are both located in the heart of London, which makes them easily accessible and conveniently located for a leisurely morning run. Indeed, since both parks begin to crowd very early and very quickly, it is best to frequent them in the first part of the morning. The parks cater to both trail and road runners alike, boosting over 10 kilometers (6.2 miles) of paved paths and trails in each park. If you need a quick, accessible run in the city, run down toward the ocean and pick up the paved path along the water, which at times hangs over the sea some fifty-plus feet above. For a more challenging route, take the Boulevard Tellene and then ascend the steep steps toward Basilique Notre-Dame de la Garde and soak up the gorgeous city and sea views from the top. Plan to take a day or two to visit the Parc national des Calanques, a beautiful and rugged national park—but only as of 2012—along the Mediterranean Sea with an extensive trail system. Take the M2 metro to the Rond-Point du Prado stop and then catch bus number 23 at the Rond-Point du Prado bus stop, just outside of the metro, to La Cayolle. From there, it’s just 1.6 kilometers (1 mile) along a paved road to the first trails and stunning Mediterranean views. The commute to La Cayolle is about 45 to 50 minutes one-way. A number of parks and green spaces can be found outside of Paris, but the city itself provides little by way of parks and trails. The paved path along the Seine River, which is wide, stretches along the river for many kilometers, is generally less crowded than the city streets, and affords splendid views of Paris’s many landmarks, proves the most optimal place to run. If you seek elevation gain and views, run north through Paris toward the Montmartre neighborhood and ascend the long staircase to the city’s highest point—Basilique du Sacré-Cœur, a church overlooking Paris that is worth visiting in its own right. East from the city center across the Vltava River is a sizeable park with many paths—both paved and dirt—and steep climbs. Cross the river on the bridge called “Most legii” and quickly find the park in front of you soon after crossing the water. On your way to the summit, roughly 180 meters (600 feet) above town, stop to explore the old castle walls, lower your heart rate from the sharp climb, and watch the trolley cars inch their way up. Trails just outside of Prague, Czech Republic. Meandering along the stone and cobblestone streets of Rome to view its many attractions—the Trevi Fountain, Spanish Steps, Colosseum, Pantheon, and so on—is a journey worth taking on its own. But to escape the busy city, run through the northern green spaces of Rome—Villa Borghese and Villa Ada—which are separated by merely a kilometer (0.7 miles) and which are easily accessible by foot and don’t require the use of public transportation. Bring your skis or snowshoes in the winter and your poles no matter what season in order to tackle the 730 meters (2,600 feet) of ascent to the summit of Gaisberg Mountain. Half a dozen routes ranging from 3 to 4 kilometers (2 to 2.5 miles) one-way take you to the top of this mountain situated a mere 4 kilometers (2.5 miles) from the city center. Cruise more easily along the paved river path that stretches nearly a dozen kilometers in both directions away from the city center. Splendid view atop Gaisberg Mountain. Salzburg, Austria. Once you visit, you won’t be surprised that the mountains around Sarajevo were home to the 1984 Winter Olympics. Wind leisurely through town on the river path or—for a much more scenic trip—climb southeast out of town along the roads toward Igman Mountain. The green space surrounding the mountain is roughly 12 kilometers (7.5 miles) from the town center and so may be best reach by car (public transportation won’t take you to the mountain itself). The trip would be made worth it as the park has a slew of trails and, with Igman topping out at 1,250 meters (over 4,000 feet), exquisite views of the surrounding mountains. Igman Mountain seen from afar. Sarajevo, Bosnia. Venice is a difficult place to run, especially if you don’t like running the same loop many times. If you stay on the main island, your best chance for a decent run is to do just that—loop around the small park and green space along the water on the eastern part of the island. For a less tedious run with a more difficult commute, take a ferry (numbers 6 or 5.1 from the ferry stop near the central train station) towards Lido—a chain of flat, thin islands slightly south and east of the main island. The ferry rides cost little and take little time and the reward is open, less trafficked roads that stretch for up to 8 kilometers (5 miles) one-way. The small islands that constitute the Lido are also connected by ferry and you can break up your run—and lengthen it—by ferry hopping from one island to the other. Majestic mountains border this Croatian capital city to the north—and they aren’t too far from the city center either. Take tram numbers 14 and 15—about a 35-minute journey one way—or run the roads north for roughly 6 kilometers (3.7 miles) to the southern entrance of the park. Trails and roads wind up the steep mountainside and if the climb doesn’t take your breath away, the views from the top will.